Humans began making cheese seven millennia ago: plenty of time to develop an enormous variety of textures, flavors, and smells, and certainly more than enough to get creative about the methods of generating even greater variety. But it seems to have taken all that time for us to come around to the potential of music as a flavoring agent. "Exposing cheese to round-the-clock music could give it more flavor and hip hop might be better than Mozart," report Reuters' Denis Balibouse and Cecile Mantovani, citing the findings of Cheese in Sound, a recent study by Swiss cheesemaker Bert Wampfler and researchers at Bern University of the Arts. "Nine wheels of Emmental cheese weighing 10 kilos (22 pounds) each were placed in wooden crates last September to test the impact of music on flavor and aroma," write Balibouse and Mantovani. The hip hop cheese heard A Tribe Called Quest's "Jazz (We've Got)," the classical cheese Mozart's "Magic Flute," the rock cheese Led Zeppelin's "Stairway to Heaven," and so on. Three other wheels heard simple low, medium, and high sonic frequencies, and one control cheese heard nothing at all. But perhaps "heard" is the wrong word: each maturing cheese received its music not through speakers but "mini transmitters to conduct the energy of the music into the cheese." That may make more plausible the results that came out when a culinary jury performed a blind taste test of all the cheeses and found that they really did come out with different flavors. 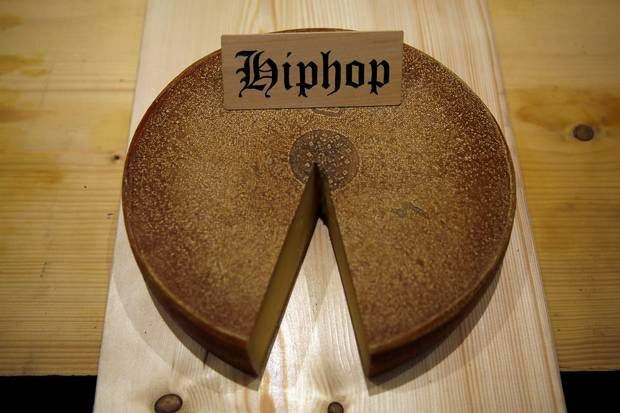 According to the project's press release, a "sensory consensus analysis carried out by food technologists from the ZHAW Zurich University of Applied Sciences" concluded that "the cheeses exposed to music had a generally mild flavor compared to the control test sample" and that "the cheese exposed to hip hop music displayed a discernibly stronger smell and stronger, fruitier taste than the other samples." Or, as Smithsonian.com's Jason Daley summarizes the findings, A Tribe Called Quest "gave the cheese an especially funky flavor, while cheese that rocked out to Led Zeppelin or relaxed with Mozart had milder tests." Cheese-lovers intrigued by the possibilities implied here would be forgiven for thinking it all still sounds a bit too much like those CD sets that claimed a baby's intelligence could be increased by playing them Mozart in the womb. But if Cheese in Sound's results hold up to further scrutiny, maybe those parents — at least those parents hoping for a funkier child — should have been playing them hip hop all along. Interesting experiment! I wonder what music does to commensal bacteria in the body? So hip-hop’s good for something after all.